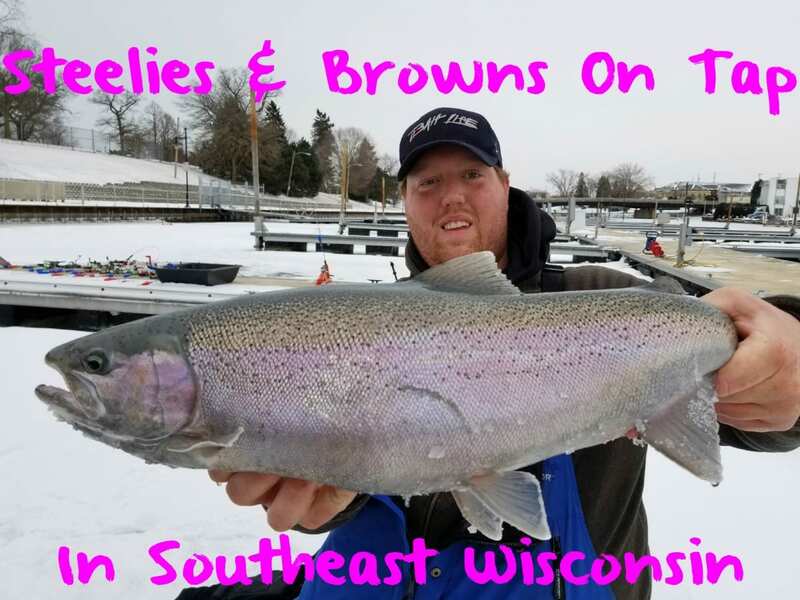 In Southeast Wisconsin this has been one of the better ice fishing seasons we’ve had catching brown trout in many years. Recently some steelhead have started to show too. With this week’s heavy rainfall more fresh steelhead are likely to arrive. We haven’t caught as many steelhead this winter as we are used to catching, but I’m predicting that will change with the rain we just had. Normally, it takes a significant rise in our rivers to draw in steelhead. Clearly that’s happened this week. With as much rain as we’ve had recently all our Southeast Wisconsin rivers are blown out and will be for a few days. However, there is still ice in Milwaukee, Sheboygan, Racine and Kenosha. I urge all ice anglers to use caution and always check the thickness of ice with a spud bar after as much rain as we’ve had. Ice conditions can change in an instant. For as long as our ice remains safe, which I’m hoping is at least another week given the current forecast, steelhead and browns will be available. The bite has slowed down the last two weeks, but we are still catching fish daily. Rather than more than a dozen catches per day we are averaging four-to-eight fish per trip now. It’s been roughly three weeks since we’ve caught a brown more than 20 pounds, but we’re catching fish up to 10 pounds every day, and a few fish in the mid teens each week. We’ve had minnows out daily, but most of our bites have come on BorX O Fire cured spawn bags. Since ice season started, Natural BorX O Fire has been the hot color. Chartreuse, pink and white spawn bags have been our best colors. The water clarity should reflect the size of sack you’re using. For example, the clearer the water the smaller the sack. When the water is dirtier, like it is now, you can get away with using a larger spawn sack. This week I’d be tying 10 to 15 eggs per sack. I’m still surprised that the minnow bite is slow, but for some reason spawn has been our go-to bait and now that more steelhead are showing spawn will work even better. I still put out minnows every day, but they haven’t been working as well as we are used to. In addition to using our Automatic Fishermen we often jig at the same time. I’ll jig with a one to three-inch white and pearl tube jig tipped with a wax worm or Brown Trout or Chartreuse Garlic Fire Balls.